Turning junk bikes into interesting treasures, on a very tight budget. 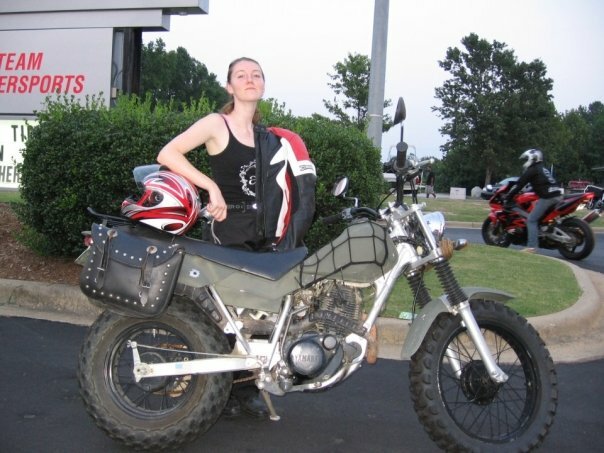 I have taught a couple of friends to ride over the years, and I've learned some things I'd like to share. First off, there is no such thing as too small of a bike. 200-250cc is the PERFECT size for a beginner. So many people start with bikes that are just WAY too big. A Kawasaki 250 Ninja will cruise all day at 80mph -- two up. It has a top speed of 105 (115 in a full tuck with a tailwind and 3 more teeth on the rear sprocket). That's plenty powerful. It's also a very light, very low bike. It's the bike I recommend the most, it's been made for years and you can find a nice example for $1500. The ONLY disadvantage is that it has plastic that is easily damaged. The bike I recommend the second most is the Yamaha TW200. First off, yes it's smaller. Yes, it's slower (with a solo top speed of 75mph, and even then only if you take 3 teeth off of the rear sprocket). But holy hell it's FUN. It's extremely low, and it has a 130 front tire and a 180 rear... and these are full-on knobbies!! It corners like a sportbike and will wheelie with some effort. In short: a total blast, even for a 235 lb fatass with several 100+ hp motorcycles and 17 years of riding experience under his belt. Whether you loan a bike to your friend, or he (or she) buys her own, the more beat up the bike is, the better. Chances are it's going to get dropped once or twice. Or wedged into trees at the edge of the parking lot. Or driven into a ditch full to the brim with sticky gooey mud. Or ridden into a telephone pole. Convince your friend to take the MSF course. It's a hassle. It's expensive. You lose an entire weekend. But it's totally worth every minute. Even after the MSF course, if they don't start riding right away, they will lose any skill they acquired VERY quickly. The first thing to do, before your friend even looks at a motorcycle, is to talk about target fixation. You go where you look. If your friend looks at the muddy ditch or the telephone pole, he's going to hit it. It's important to drill into the student, if there's trouble, if there's panic, LOOK WHERE YOU WANT TO GO. This is the MOST important lesson. You should take time to teach the student where the controls are. Clutch, brake, throttle, etc. I'm not going to go into that. (It's very helpful if the student knows how to drive a stick, that makes things *so* much easier.) But the SECOND most important lesson is, if there's trouble, if there's panic, the first thing to do is look where you want to go. The second thing is to pull in the clutch and close the throttle. Continue with starting and stopping in a straight line. Don't have them do it once. Or even twice. The student needs to complete 30 or so drills. Start moving, clutch completely out, clutch in, brake to a stop. Do it over and over again. Feet should be ON THE PEGS the moment the bike starts moving. When out of straightaway, have the student slip the clutch and WALK the bike around to point the other direction. Once he has a handle on that, it's time for turns. The hardest thing for a beginner is starting off and turning at the same time. So, use chalk or cones to set up an intersection in your parking lot, and have the student start off with making 90-degree right-hand turns. Feet should be on the pegs the moment the bike starts moving -- dragging your feet actually makes it much more difficult to execute the turn. Do another 30 drills, until he has it right. Then do left turns. Don't forget, you go where you look! Now he's ready to graduate to shifting. Have him go down the parking lot, upshifting until half way across, then downshifting the other half. Then turn around with feet on the pegs, and continue back the way he came. Again, at least 30 drills. Now your student is getting cocky, so it's time to go back to basics. Find a hill, and have the student practice holding the bike in place using only the clutch. Have him walk it up the hill, and then slip the clutch and roll it down the hill backwards. Clutch control is essential, it's the place where the beginner makes the most mistakes at first, and drills like these really make a difference in building skill -- and confidence. Now the student is ready to graduate to riding on the street. But limit it to lightly traveled surface roads at first, at slow speeds, with you FOLLOWING, not leading. This is so you can watch the student and make a judgement whether you should continue riding, or head back to the parking lot for more practice. It's also so the student doesn't feel like he or she has to keep up with you. You go at his pace. A cocky friend and 75hp (or more) motorcycles do not mix. Instead they make a skid mark down the driveway and across the street, and then a deep muddy rut across the neighbor's lawn, culminating with the bike climbing the front porch stairs and falling over. Also screaming -- lots of screaming and stained underwear from the both of you. New riders do the damndest things. Like find the only telephone pole in the entire parking lot, and hit it. Or turning the throttle too hard, panicking, and ending up in the trees at the side of the parking lot, held up by branches with the bike 5 feet in front of him, also wedged into branches. If your friend crashes but is okay, and she removes her helmet and glasses... take her glasses from her. She won't remember where she put them, and they will be stepped on after a frantic 45-minute search in tall grass. Don't teach your friend to ride on a chopper with 7" over fork tubes and some serious rake. Sure, it's stable in a straight line. Sure, the floorboards keep it from falling over beyond about 30 degrees, so it won't be damaged. But he'll never learn to turn that thing. Ever. Cute girls on Mad-Max looking ratbikes are all sorts of awesome. This is the clutch basket. If you look closely, you can see there are nice shiny marks on the fingers of the basket. Running your fingers over these, the shiny areas are actually indentions, and the dull areas raised ridges. What has happened is that this is a high mileage (50k) bike, and over time gunning the throttle has caused the clutch plates to slam into the fingers, which has create these shiny indentions. They don't look it, but they're deep enough at this point to occasionally catch the clutch plates, and prevent them from moving away from each other. The plates are firmly stuck in the indention. I'm painstakingly filing off material until the ridges are down to the same level as the indentions, and it's all completely smooth again. You can see I've completed one finger already, as the whole thing is nice and shiny. (leftmost finger) I did this filing for all the fingers, tossed it all back together, and was even able to reuse the clutch cover gasket. We even leaned the bike over in the grass so it wasn't even necessary to replace the oil. Now, this fix is cheap, but there's a problem with it. It won't last forever. In fact, it won't last as long as the original clutch basket did. 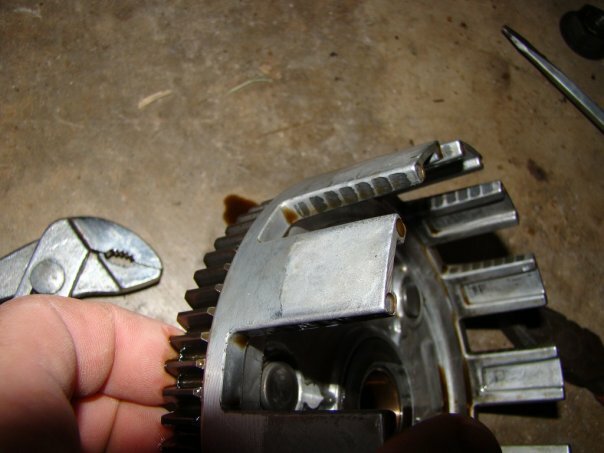 By filing the material down, there is even MORE slop in the clutch, which will cause the same problem to happen all over again -- and it will happen in fewer miles. So, it's a passable repair, that will probably get you another 20,000 miles. But it's not a permanent repair. 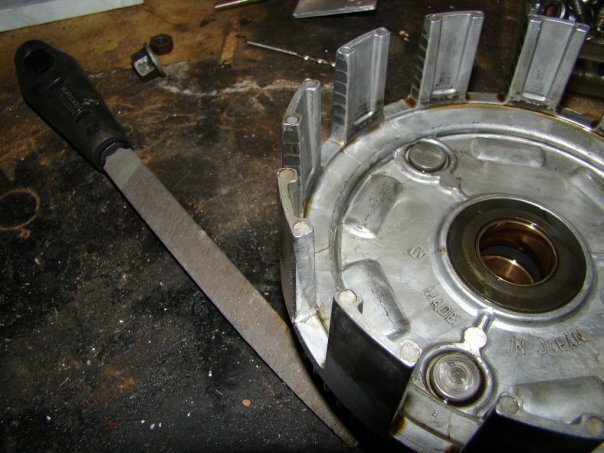 Then again, nothing that has to do with your clutch is a *permanent* repair. They will all wear this way. Anyhow, this is your technical tutorial for the day. 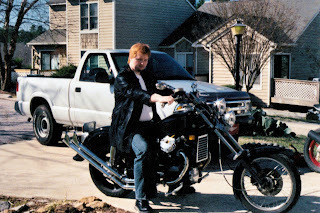 Right now I'm updating the CX500 Chopper Project, slowly reformatting the old posts (from http://cx500forum.com) to this new Blogger blog. New posts will come after the old stuff is back up! I'm splitting choppercharles.com off into a blog about my motorcycle builds. The cx500forum will always and forever remain at cx500forum.com. The only thing that changed is that choppercharles.com no longer redirects there. I build bikes and fabricate parts with basic hand and bench tools, a torch, and a wire-feed (flux) welder. My mechanical prowess is strictly self-taught -- I went to college for computers. This blog contains the story of my builds and my general musings on all things motorcycle.